On Friday 11th July at 07:35, we received a call from Police Constable James Dee about a live-stranded dolphin on the shore opposite Cramond Island near Leith, Edinburgh. Local BDMLR Coordinators Gareth Norman and David Fuller-Shapcott were scrambled to the scene, as Dr Kevin Robinson (Director of the CRRU and National Coordinator for BDMLR Scotland) talked the constable through an assessment procedure and basic first aid administration for the clearly distressed animal, to make it as comfortable as possible. With Stephanie Castle at the helm, the CRRU team spent the following hours rounding up local BDMLR, SSPCA and Deep Sea World Medics from the Edingurgh area.Over the next few hours, the rescue party gradually grew in number as the local Lothian & Borders fire-fighting team joined the rescue effort. In the meantime, the CRRU team worked exhaustively from land and mobile lines to find a vet from the Royal Veterinary College in Edinburgh to assist the animal. Dr Robinson's initial phone assessment with PC Dee indicated that the casualty was a male white-beaked dolphin (Lagenorhynchus albirostris), approximately 9 ft in length. The animal had been discovered at 04:30 hrs that morning by a local couple on an early morning walk. 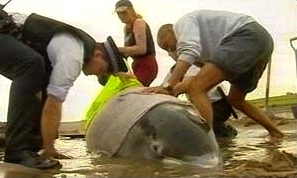 Initially thought to be in good body condition, photographs of the dolphin were emailed from the scene to BDMLR Senior Vet James Barnett in West Sussex who concluded that the animal was in fact quite badly malnourished with little muscle tone around and beneath the dorsal fin (photo right). Veterinarian Maria Parker arrived on the scene at approximately 11:00 hrs from the Small Animal Hospital at Edinburgh Zoo. A blood sample was taken by the vet and the dolphin's temperature was measured. A check was also made of the teeth which revealed that many were absent and those that were present were very worn; indicating an older animal. Based on these findings, the vets decided that they could not support a refloat for an animal in this condition. However, the rescue team decided that after all their hard work with the animal, they would still wait for the results of the blood results before any decision was made to put the dolphin to sleep, and medics continued to keep the animal in as stable a condition as possible. When the news of the blood results arrived, however, there was further bad news. Following sedation, a lethal injection was finally administered at 14:30 hrs. These decisions are never taken lightly, and it is always very hard for all those present at such an event - who have all worked so hard and for so many hours with the animal - to endure such an outcome. However, the welfare of the dolphin ultimately has to be put first. From all at CRRU HQ, a HUGE thank you to all those organisations and individuals who worked so effectively together to make this operation run so smootly: especially local bobbies James Dee & Raymond Jarrett, the Lothian Fire Fighters, BDMLR, CRRU & SSPCA medics at and behind the scenes, staff at Deep Sea World, attending vets Maria Parker & Rachel Kilroy, BDMLR vet James Barnett, and supporting members of the public! Thank you. To learn more about the species, visit: our "fact file" section HERE.